Abigail Allwood treks towards a series of mud mounds in the Morocco desert. "Hmm … This probably isn't anything." "Look at that; you found a good one!" We were hunting for fossils in an ancient seabed that dates back to the Devonian Period, roughly 400 million years ago. At our feet, rock fragments are embedded with trilobites, brachiopods, corals and other sea creatures both extinct and still existing in the oceans today. Although some of the fossils look quite alien, they are unmistakably remnants of life. This field trip in the Morocco desert was organized by the International Research School of Planetary Sciences' Ibn Battuta Centre. The various locations we visited were meant to illustrate how this region of Africa has many similarities to the alien landscape of Mars. Deep-digging drills will be required to access any possible remains, since they might be buried in marine sediments dating back to 3.5 billion years ago. Such drills also could help us discover whether life exists on Mars today, surviving in underground reservoirs where it would be protected from the harsh surface conditions. It's still just a hypothesis that the surface of Mars was once awash with liquid water, but over the past 40 years different missions have gathered a compelling amount of evidence that supports this scenario. Whether life on Mars ever existed, however, is still an open question. Looking for trilobites and other ancient marine fossils on a mud mound in Morocco. NASA's first search for life on Mars took place in the 1970s, as part of the Viking mission. Looking for chemical signs of existing microbial life, Viking's Labeled Release experiment added liquid nutrients to Martian soil. The presumption was that any microbes living in the soil would eat the nutrients and expel certain gases as a waste product. Scientists are still arguing about the results, but most think the instantaneous gas release that occurred was due to a purely chemical reaction, since life presumably would need more time to process food. The search for life itself will begin again with the Mars Science Laboratory, scheduled for launch this year. MSL, renamed "Curiosity" rover, will look for biosignatures and evidence of microbial metabolisms. The planned ExoMars missions, joint ventures of NASA and the European Space Agency, also will hunt for life on Mars. Janet Siefert walks in a field of fossilized stromatolites, evidence of an ancient lagoon. 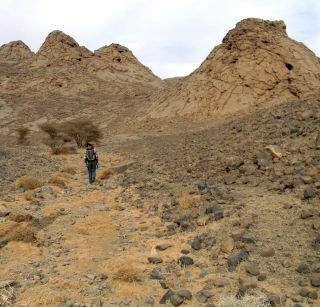 Our fossil-hunting grounds in Morocco included mud mounds that — although today high and dry — were born in a relatively shallow sea. Such submarine mud volcanoes can be the result of gas escaping from underneath Earth's crust, forcing great quantities of liquid and fine-grained rock to the surface. To my eyes, the mounds looked like ogres in a science fiction film, the ancient vents forming drooping eyes and a sagging, crumbling mouth. The monstrous mounds remained mute during our visit, but scientists are trying to learn their story by other means. A vein of travertine, for instance, is a clue that at least one of the mounds we visited had a hydrothermal origin. Other mounds may have been built by so-called "cold seeps," which have milder temperatures. Several mounds are lined up in a row, indicating they bubbled up along a natural fault in the Earth’s crust. First identified by scientists in the 1930s, many of the Morocco mounds are made of carbonate mud. The term "mud" refers to the grain size of the rocks — micrite and fine-silt — rather than a composition of sediment mixed with clay. One question scientists are trying to answer is how much of the mounds were generated by geological processes, and how much do they owe their existence to life? The abundance of fossils in and around the mounds may have caused the mounds to grow ever larger, as structures like corals acted as catchment basins for sediments and life’s waste products that piled up over time. The "overprinting" by fossils also masks a deeper truth: the role played by life that we can't see with the naked eye. Impressive fossils for sale at a shop at the edge of the desert. Microbes may have been crucial in building the mounds, since the anaerobic bacterial oxidation of methane can lead to carbonate precipitation and also turn mud into stone.Barbara Cavalazzi of the University of Johannesburg, one of the field trip leaders, published a 2007 study in the journal Astrobiology that discussed the various microfossils found within the mounds. But even after years of analysis, the mounds remain frustratingly impenetrable. There aren't any fresh cross-sections available for easy viewing; the few mounds that were cleaved in half through fortuitous natural processes are now so weathered that the details have faded away. Another way to inspect the inside layers of a mud mound would be to arduously drill holes at different points along them. A less strenuous study would look at rocks that have fallen down off the mounds. However, "those studies don’t provide a full picture of the mounds, and are really just random shots in the dark," said Abigail Allwood, a geologist with the Jet Propulsion Laboratory who attended the field trip. To date, there is no complete picture of the structure and method of formation of the mud mounds. Studying such mounds on Earth can inform our investigations of Mars. Research published in the journal Icaruslast year pointed to possible mud volcanoes in the northern plains of Mars. The Icarus study mapped more than 18,000 circular mounds thought to be mud volcanoes in the Acidalia Planitiaregion, and estimated that more than 40,000 eventually could be found. Using data obtained from the Mars Reconnaissance Orbiter, the scientists were able to investigate the structure and mineralogy of some of the mounds. This allowed them to rule out other means of mound construction, such as meteorite impacts, lava flows, or ground deformation caused by ice or evaporation. Life probably didn't play a role in building the Martian mounds as it did on Earth. However, because volcanoes bring up fluids from deep underground, any biosignatures of past or present life also could have been brought up to the planet’s surface. The study authors therefore point to the mounds as key places to search for evidence of life on Mars. We were in Morocco in February, when history of the human sort was being made nearby. Every TV set was tuned to the street protests in Egypt, and President Hosni Mubarak seemed poised to step down from office. Or would he refuse to relinquish the reins of power that he had held for 30 years? For some in Morocco, there was no question, as one local said adamantly, "He is finished," making a sweeping motion with his hand. Turns out, he was right. By the end of our journey, Mubarak had stepped down, bowing to public pressure. From present-day politics to fossils suspended in time, life had a story to tell wherever we traveled. Some tales were short but thrilling: a shed snake skin, obvious proof of recent life. Other stories were as intangible and ephemeral as a spoken haiku: potential "trace" evidence such as bird tracks in desert sand. Then there are long and complicated sagas, such as the 600-million-year old stromatolites that were evidence of ancient lagoon-dwelling microbes. Stromatolites are an example of the difficulties that can arise when interpreting evidence for life. These rock structures are built by microbes and are the lithified remnants of biofilms that grew in watery environments. However, rocks that resemble stromatolites also can be made through the natural accumulation of minerals or sediments. The older a stromatolite gets, the harder it can be to link it to life, since the delicate materials of organic bodies degrade over time. "Proving that morphological structures like stromatolites were produced by bacteria requires the preservation of multiple lines of evidence consistent with life," said Sherry L. Cady, editor-in-chief of the journal Astrobiologyand one of the field trip participants. Cady and her colleagues published a 2003 paper in the journal that discussed the limitations of using fossil structures to identify microbial life. While the biological origin of the stromatolites we visited is not disputed, the debate over other, much older structures complicates the story of life's history on Earth. What tangled tale still waits to be told on Mars? Despite talk of sending a human mission to the Red Planet, it will be awhile before astronauts can hunt for fossils in Acidalia Planitiaand other promising sites on Mars. Robots will be our avatars for the foreseeable future. This second-hand survey is more difficult, since robots are ponderously slow, require a constant stream of commands from Mission Control, and can't get help if they get caught in a sand trap or some other tight spot. And perhaps, such a remote-controlled search is a bit less satisfying in the end. For those of us who didn’t find any salvageable fossils in Morocco, beautiful specimens were on display at shops at the desert's edge. The fossils for sale were larger and more impressive than the shattered fragments in the field, but as one of the scientists noted, "The fossils you find yourself just seem more special."